The Gravity Discovery Centre (GDC) in Gingin is teaming up with performance artists Genrefonix for an amazing show made especially for National Science Week 2018. Walbrininy, a completely new and original musical production, suitable for all ages, will be performed at the GDC on Saturday 11 August and Sunday 12 August. Through ‘sci-fi’ film sequences, live music, and Indigenous storytelling, a mind-boggling world of spiralling neutron stars will be uncovered, demonstrating how Earth’s scientists are now ‘listening to the universe’. The show’s innovative format explores these new frontiers of astronomy and delivers fresh, fun and fanciful tales from distant worlds, as well as pausing to look in our own back yard. The inspiring GDC venue will be fully exploited with audiences journeying throughout the award-winning facility. Not-to-be-missed highlights include the spectacular arrival of a VIA (Very Important Alien) and spaceship! 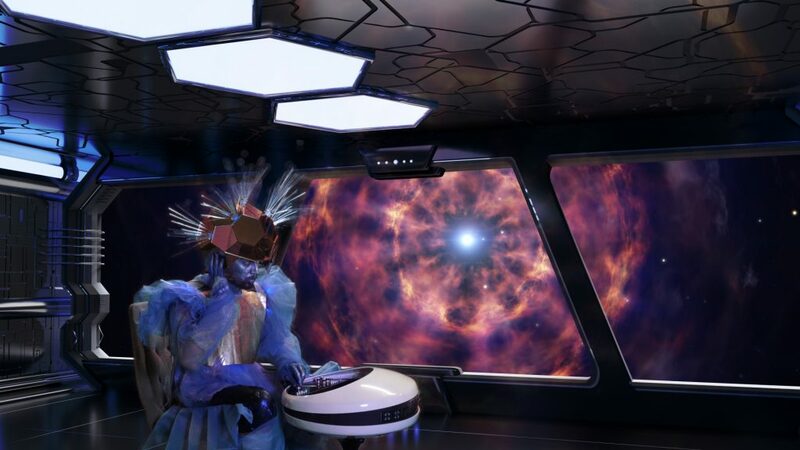 The interstellar traveller will be landing at the GDC to provide knowledge, wisdom, fun and entertainment and to raise questions; encouraging thinking about space sciences and the long-held knowledge of the world’s first astronomers. In Noongar language the concept of ‘walbrininy’ means total wellbeing, all encompassing, everything connected and right. In musical terms we might think of this as harmony. In the show Walbrininy is reimagined as a fictional planet, existing 130 million years ago, in a far-flung galaxy, bound by the harmonic gravitational pull of two spiralling neutron stars. ‘Walbrininians’ were deeply spiritual beings intimately connected to their spinning suns, highly aware that these ‘quantum monsters’ would eventually meet and combine, concluding their cosmic dance in a blazing ‘kilanova’ whose symphonic explosion would be felt and heard across the universe. We eventually heard it here on Earth, just a couple of years ago! Luckily for Earth we are prepared. Our brightest scientists, including teams at Gingin, detected the kilonova’s gravitational wave as it passed through us on 17 August 2017. We called it GW170817 and celebrated the spoils of 100 years of international scientific endeavour. But has our planet’s understanding of the universe evolved enough to capitalise on this momentous visit? Will an alien that has been travelling since the dreamtime be impressed by our achievements in this pokey little corner of the Milky Way? Is there something we’ve missed? Join our ground crew: GDC’s lead astronomer Rick Tonello, Noongar Elder Noel Nannup, the Moorditj Mob dancers, and space rockers Genrefonix for a musical celebration and welcome party for our new alien friend. Receive intergalactic wisdom and see the amazing sights and sounds of the universe in a theatrical production that is out of this world and only one hour from Perth!